Sounds of fighting had ceased in Aleppo by late Tuesday, casting a rare silent night on the embattled Syrian city, RT’s Lizzie Phelan reports from the scene. An anticipated peaceful withdrawal of those militants left in the city’s east remains to be confirmed. “First hours in weeks here in #Aleppo without the sound of shelling and gunfire,” Phelan tweeted late on Tuesday. Phelan, who this year spent months on the ground in Syria, often covering developments on the frontline of fighting, reports that it is “the quietest night in Aleppo” she experienced in the last year. Just 24 hours ago, Phelan filmed central Aleppo streets filled with celebratory gunfire and cheering people with Syrian flags, who went out despite lashing rain to welcome the reports the Battle of Aleppo might be coming to its end, with the government forces surrounding the last militant-controlled areas. The reporter later tweeted that the people were “celebrating hope returning that death will end now,”referring to more than four years of fighting in the city and the random shelling that western Aleppo neighborhoods suffered from rebel-occupied east. Phelan said she was still waiting for confirmation on the withdrawal of the militants from eastern Aleppo. Earlier, RIA Novosti cited military sources on the ground as saying the remaining militants have agreed to withdraw and are expected to leave to rebel-held territories outside the embattled city in the coming hours. “There is no fighting. We are coordinating the details. According to the agreement, the terrorists and their families will leave the city through the Ramusi checkpoint to the west. The buses have already been prepared,” one source said. “Total silence has been observed in the city since evening. There is no information on shooting. Probably, there were single shots fired in celebration, as on the day before,” Aleppo governor’s press service told the news agency. The Al Mayadeen TV channel reported that some 5,000 militants and their families will be evacuated from the city on Wednesday. The withdrawal is supposed to be carried out with the help of the International Committee of the Red Cross (ICRC) via a special corridor, the channel said. 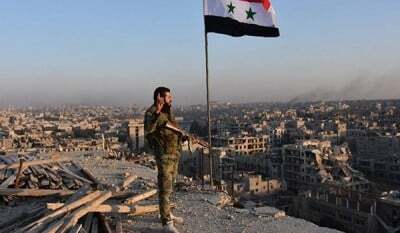 Some of the militants will then head to the rebel-held Idlib province. On Tuesday, the UN’s Syrian envoy, Staffan de Mistura, said that “a maximum 4-5 square kilometers, probably even less”were under control of the militants. He put the number of rebels that keep holding out in eastern Aleppo at 1,500, noting that about 30 percent of them represented by Al-Nusra terrorists. According to his estimates, some 50,000 civilians could be trapped in eastern Aleppo, but the exact number is unknown. While the liberation of Aleppo from militants is expected to be soon complete, life in Syria will be not going back to normal overnight as no political settlement to the crisis has been reached, Russia’s UN envoy Vitaly Churkin warned as he spoke to reporters Tuesday. “To say that the conflict in Syria nears its end, will be, of course, exaggeration. We have still a long way to go, but we wish, that this way will return to the trajectory outlined in the resolution adopted in December last year, which stipulates the need to write a new Constitution for Syria, to hold elections under international supervision,” Churkin said after the UN meeting on Syria. Some 7,796 civilians, including 3,946 children, have been evacuated from eastern Aleppo districts within the last 24 hours, the Russian Center for Reconciliation of Warring Parties, which assisted the evacuation, reported. It added that 375 militants had laid down their arms. Since the start of the offensive, over 110,000 civilians, including 44,367 children, have been rescued from the rebel-held areas of the city. So far, around 7,000 people were able to go back to their homes in the liberated parts of eastern Aleppo from government-controlled neighborhoods. Russia also continues to deliver tons of humanitarian aid to Aleppo civilians, the center said. Meanwhile, Russian bomb disposal specialists have been assisting in detecting and destroying explosives left by the militants in schools, hospitals and other public institutions. Those were used as militant headquarters, sharia courts or munition depots, experts on the ground have revealed. Within last 24 hours, some 1200 explosive devices have been defused by the bomb disposal crews. As the mainstream media continues to paint an extremely grim picture of the developing situation in Aleppo, some governments appear to be insisting that the negative one-sided view of the liberation of the eastern part of the city being presented by the likes of CNN is the only acceptable one. “Yeah, I think maybe you did over-speak,” Kirby said, arguing that “you don’t have to look any more or any further than the network news and what’s on cable and online right now” to see “pretty gut-wrenching” images from Aleppo. He went on to say that “brutality, violence and bloodshed, and a lot of destroyed, wrecked lives of families” was “all” the State Department has seen happening there. Here is what actual Aleppo residents told RT when asked about east Aleppo’s liberation from terrorists and rebel militants, as scores poured into the city’s streets late on Monday chanting, cheering, and shooting into the air in celebration. “This is the best day of my life. I cannot believe that this day has come! May God bless the Army,” a young woman said. “Two of my nephews gave their lives fighting for Aleppo. I wish they could be here with us to share in these celebrations,”another woman said. “This is a great victory, a victory for all Syrian people. And we hope it will finally bring peace and safety to our city,” a man responded. “The victory gives us a chance to fulfill our dreams. Now we can study and become journalists and doctors,” a girl said. “Today we can sleep in peace and be sure that tomorrow our children will go to school and we won’t have to worry about the situation,” a mother said.